← What does the island fox say? high fecundity, variation in reproductive success and pronounced early mortality, resulting in genetic drift across generations. In other words, the adults who are the ones reproducing are only a fraction of the total population. Low effective to census population size ratios are one of the key predictions of the ‘sweepstakes reproductive success’ (SRS). Yet, in the marine environment, the different methods and predictions used to test this hypothesis have resulted in conflicting outcomes. One way to resolve discrepancies in testing SRS is to use temporal sampling. Riquet and colleagues from the Station Biologique de Roscoff used the marine invasive gastropod Crepidula fornicata as a model to test SRS in a new paper in Heredity. 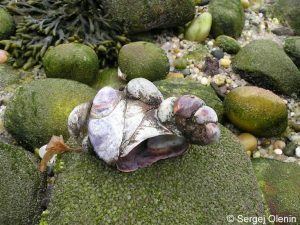 They followed the annual recruitment of Crepidula for nine consecutive years in the Bay of Morlaix in Brittany, France. Genetic diversity varied, in part, due to the fluctuations in recruitment intensity, but also attributed to nonrandom differences in reproductive success across the years. There were strong departures from HWE that were not attributed to null alleles, but rather to a temporal Wahlund effect. A temporal Wahlund effect can arise from the juxtaposition of several groups with different allele frequencies, that is, offspring from different families. Temporal genetic variation and a reduced effective population size are both signatures of a reproductive lottery, but the genetic drift is weak in C. fornicata relative to other marine species. This could be due to particular life history attributes of this invasive gastropod which may play an important role in buffering genetic drift. This entry was posted in evolution, natural history, population genetics, selection and tagged Crepidula, invasive species, mating system, population genetics, reproductive success. Bookmark the permalink.